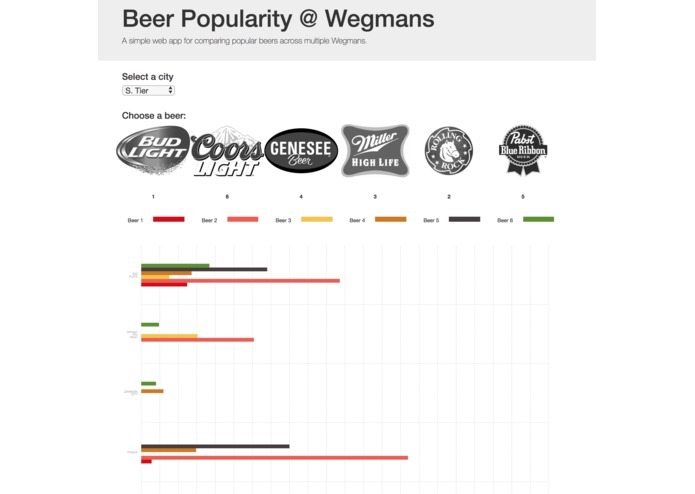 The Wegmans API seemed like a treasure trove of fun data to play with. We wanted to work with something we had a personal interest in, and decided to measure which types of beers are most popular within different sale zones. 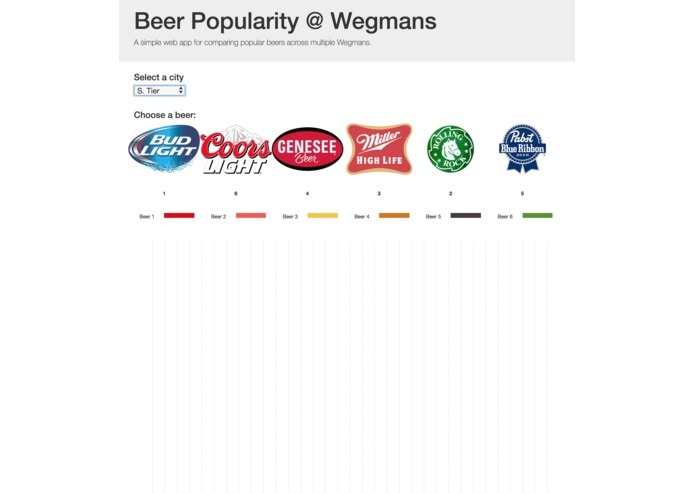 Beer Popularity allows the user to select a Wegman's 'Sale Zone', as well as a beer. This data is used to query the 'Sales Velocity' of each selected beer at all of the stores within the chosen Sale Zone. We developed a script using jQuery to interact with the Wegman's API. A basic HTML webpage is used to input data. We had some initial problems using the Wegmans API. Originally we wanted to focus more on Sales data but realized we didn't have permissions for those data sets. We transitioned to using the arbitrary sales velocity value, which then led to us reaching limits in the number of queries we were performing. By reducing the amount of possible stores and beers that could be queried, we were able to work around this limit to create something we're proud of. Worked at gathering data from the API and storing it in ways that could easily be displayed by the view.